The origin of BBP comes from owner Jae Staats' 9 years as a ballboy for the Phoenix Suns which led into an 18 year career with this NBA team. 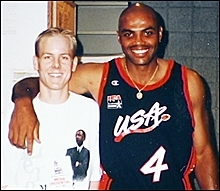 But more specifically, Jae owes his long-standing reputation and identity as a ballboy to the one and only Charles Barkley. Feature article in Arizona Republic. Charles regularly beckoned Jae with shouts of "Hey ballboy, come here!" or "What's up, Chumpy?" Deciding the latter was not a good name for a business, Jae chose BallBoy Productions as his company's name after leaving the Suns in 1998. Jae gained his video experiences from working with the Phoenix Suns. As the assistant video coordinator, Jae's responsibilities included filming practices and editing game film and college scouting reports. The Suns were the first professional sports team to utilize a non-linear editing system which Jae learned to use. After a successful career with the Suns, Jae started his own business to fulfill his passion for filmmaking and telling stories through video and film. Over the course of 20 years, Jae has worked with many high-profile companies and made an impact on the television and film scene in Arizona. Jae also takes pride in his work for smaller companies and non-profit clients. In 2005, Jae founded the Almost Famous Film Festival. This non-profit organization became one of the largest film challenges in the country with 23 hosted events and more than 1000 films produced under the A3F name. The festival also introduced Jae to Jason Francois who serves as co-director of the A3F and works with BBP on all video and film shoots. The Desert Botanical Garden has worked with BallBoy Productions for more than 7 years. During this time we've produced TV commercials to drive attendance, promotional spots for the Conservation Alliance and Culture Pass, and even a short film introducing the Garden to attendees at the annual American Public Gardens Conference. The team at BallBoy Productions is reliable, talented and committed to a great end product and I highly recommend them. BallBoy Productions was so wonderful to work with. They took the time and effort to really understand the vision we had for our video. They made all of the interviewees feel comfortable and really went above and beyond to capture the true essence of our community and story. BallBoy Productions LLC © 2019 | We create videos, commercials and films.